The message for Runrig fans is, the band that put Gaelic into rock and roll may have released its last studio album, The Story, this week but it hasn’t stopped making music. Indeed, with concerts at Edinburgh Castle and the HebCelt festival in Stornoway planned this summer, as well as three open-air gigs just announced in Denmark, the big events that have proved such a popular rallying point for the Runrig massive down the years are set to continue indefinitely. Behind the decision lies a certain disenchantment with the way recorded music is consumed in the age of downloads and iPad shuffle programming. MacDonald freely concedes he is of the old school that listened to – and in his case made – albums that had a beginning, a middle and an end, and a running order that became almost as big a part of the listening experience as the music itself. In the beginning the MacDonald brothers were two music mad youngsters who absorbed the sounds that were all around them as they grew up on North Uist and later in Portree on the Isle of Skye. Their dad sang and there were regular ceilidhs in their own house and the houses round about. Radio Luxemburg added the Beatles and the Stones to the dance band music and folk groups they heard, such as Robin Hall & Jimmie MacGregor and the Joe Gordon Folk Four. Generations of Gaels and Highlands and Islands-bred musicians and music lovers, to say nothing of Runrig’s wider rock following, have much to thank that moment for. Although it was some time before the MacDonalds plucked up the courage to let anyone else hear the songs they’d been working on behind closed doors, many of their creations have gone on to achieve the ultimate compliment for composers working in the Gaelic and traditional idioms and have passed into the tradition. To musicians such as Angus MacPhail of the popular Highland band Skipinnish, who are carrying on the MacDonalds’ tradition and have the brothers’ admiration and seal of approval, Runrig helped to provide a sense of identity. And to the huge numbers of Germans and North Europeans who have taken the band to their hearts, Runrig have clearly fulfilled a need. The Story is released on Ridge Records. 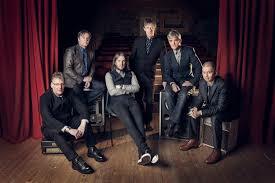 Runrig play Aberdeen Music Hall on February 10; Glasgow Royal Concert Hall, February 11; Dundee Caird Hall, February 12: and Edinburgh Usher Hall, February 13.